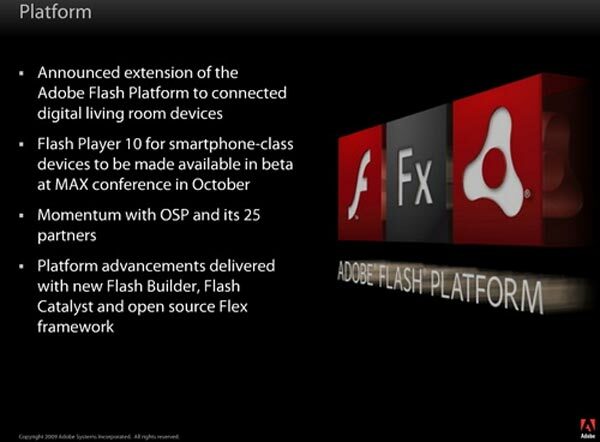 Adobe has unveilied its latest Flash 10.1 player which will allow for all Flash content to be played on smartphones, virtually every new smartphone will be able to use the player except the Apple iPhone. So basically if you own a Windows Mobile, WebOS, Android, Symbian or Blackberry smartphone you will be able to use the new Flash player on your mobile phone. Unfortunately iPhone users will have to wait until Adobe manage to produce a version for the iPhone that Apple are happy with, lets hope this happens soon as Flash player 10.1 has some interesting features. Some of the features include multi-touch support as well as accelerometer screen orientation, as well as Full HD playback from YouTube.